Little things can mean a lot in sorrow. For me, those crazy dandelions courageously kept returning every spring and made me smile. Other widows have told me about finding pennies at just the right moment. I'm sure we'd all love to hear about the signs of God at work in your life too so please add a comment today. Here's a version of this little poem reminding us that we're not alone. 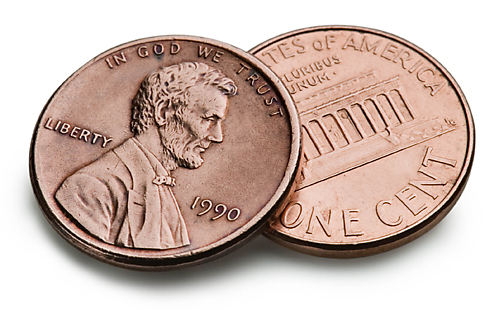 Let's keep our eyes open for pennies today. Oh yes! How I love those moments when I spot one! They always seem to "show up" at just the time I need a little "hug". Now I silently say thanks and leave them for someone else to find - feels like I'm passing on the blessing somehow! For me it's not pennies so much, because we always were picking them when we saw them and thought of them as gifts from God. It is heart shaped things, leaves, rocks, buttons, anything found like that. My dear husband would bring me hearts he found, or he would leave them where I would find them when I came home from work. One day he found one inside a piece of wood he had cut, and brought it in to me. He told me to close my eyes and hold out my hands and he laid the piece of wood there. What a delightful surprise. But, just the other day when I was outside with camera in hand I spied a heart shaped leaf on the patio and snapped it's picture. That was a gift to me about God's love and my husbands love too. God knows we need these little love gifts, whether they be pennies, hearts or any other little thing that we look at as a blessing. They bring bits of joy and rays of sunshine to our wounded hearts. I think God gives us love gifts all the time. It is a matter of whether we have our spiritual eyes open to see them. A couple things really stick out in my mind. I will share one of them. On August 24 2010 God put this fantastic rainbow in the sky. I hadn't seen such a beautiful rainbow in a long time if ever, and I haven't seen one that beautiful since. That day was also my birthday. The next few months were the last months of Wayne's life. They were difficult months Wayne passed away on Jan 2, 20ll. Then came the months of deep grieving. I think God was reminding me of His faithfulness that August evening in 2010. He knew I would need that reminder in the near future. A couple things really stick out in my mind. I will share one of them. On August 24 2010 God put this fantastic rainbow in the sky. I hadn't seen such a beautiful rainbow in a long time if ever, and I haven't seen one that beautiful since. That day was also my birthday. The next few months were the last months of Wayne's life. They were difficult months. Wayne passed away on Jan 2,20ll. Then came the months of deep grieving. I think God was reminding me of His faithfulness that August evening in 2010. He knew I would need that reminder in the near future. Mine is pink roses.My mother loved a certain shade of pink, and soon after she died, I saw the most beautiful hot pink rose at a nursery. I said out load to her, "oh mom, you should see this rose." I clearly heard her reply, "oh honey, you should see the ones here!" then when my husband died, my daughter and I smelled roses like the room was filled with them! When she was writing down something she wanted to say at his memorial service, she called me over and we both smelled roses again. one more time right after his service my son, daughter and I smelled them again. So for me it will always be roses, pink ones. I had a lovely potted summer arrangement on the porch with lots of red and purple flowers. I remarked to my husband that I hoped we'd get hummingbirds. We had none until two days after he died when a hummingbird visited every afternoon for the rest of the summer. I know he wanted me to have a hummingbird for comfort. Also, my daughter is due with her second baby on the first anniversary of her Dad's death. I thank God for giving our family such a wonderful gift at a time we will need it most. These are beautiful stories! I'm thrilled that you all would share them and I hope others will feel free to share their stories too. I never know what will come of these daily blogs I post, but your comments on this one are really special. I found a penny in the parking lot at Target today!! !